I hope that you like the face and body wash. This is the only thing that I use to wash my face anymore. I am a convert. Jasmine is my favorite scent also. I think Wednesday's blog is a recipe for a jasmine scented oil, so check back. Looks very good! I would have a try. Sounds nice. Like you, I have become allergic to most 'commercial' type cosmetics, lotions and potions. I have switched to using only Dr. Bronners Castille soap for bathing and essential oils. I also use a lot of apple cider vinegar in my baths, with a personally mixed blend of oils to soften and protect the skin. It is UNbelievable the change in my skin, my ability to get out in the sun (I have Lupus) and the difference in how my skin feels to live in! I use mostly peppermint, rosemary, lavender for bathing, for facial pampering and even for scalp oil. I hope that you like this recipe. I will say prayers for you. I am happy that you are finding that there are products out there that help you feel better. Can I use a fragrance oil other than Jasmine? I have some Sweet Orange Oil that I love. Thank you for your replies!! You can use any essential oil that you like. I Sweet Orange is great. I have also used tangerine, and also spearmint and lavender. I love that last combination. Have fun playing with this. It should be fun. Thanks so much for stopping by. I love this face wash. It works really well. Have a great week. Sorry it took me so long to answer. Where did you get the bottle this is dispensed in? I got the bottle at Target in the bathroom section. I hope that helps. Thanks so much for stopping by. I wanted to now how long is the life of the product? I'm sorry, since you're a no reply blogger I can't answer by email. I don't think I have had this sitting around any longer then 3 to 4 months. We use it fairly quickly, it may last longer, but I can't tell you for sure. Could I use castile bar soap and melt it down? If so, suggestions how to do this? I have 3 bars. I'm sorry, since you're a no reply blogger I can't answer by email. You could probably melt it down with about 4 cups of water, but that is just a guess. I haven't tried that before for this. I have melted the soap down for shave cream and shave soap, and I just use a small amount of water for that. Start with 2 cups and if it still seems too thick, then add more. I would also use distilled water to make sure that you don't get any bacteria in your soap. what size container do you use and does it have to be glass or plastic? This makes about 18 ounces. I just used a hand soap bottle on that I got on sale from Target. It doesn't hold all of it. It is probably about 15 ounces. I just store the additional amount in bottle and then refill it as necessary. 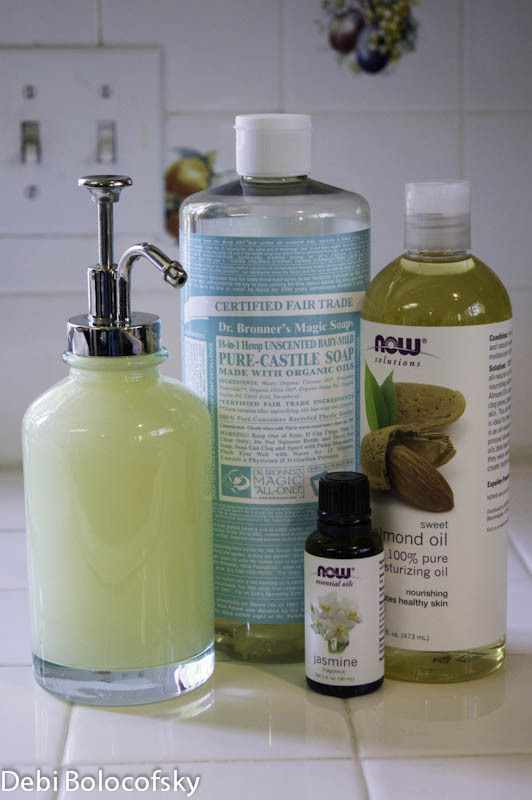 Your recipe gave me an idea to try Jojoba oil, since I have a bottle of it that needs to be used up. Then, I have some peppermint oil I might try. When I've tried to make soap from castile liquid, and put it in a pump bottle, it was to thin. Does the oil thicken it up? Thanks.